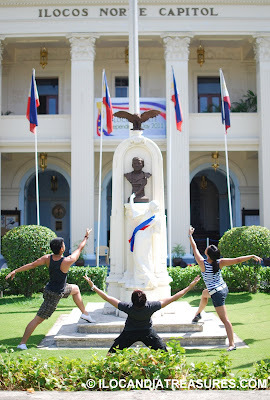 We had fun photo shoot with my group The Ilocandia Photographic Society (TIPS) entitled Dancers Among Us on June 19, 2011, the 150th birth anniversary of the great martyr Dr. Jose Rizal. As a tribute to the great national hero of the Philippines, I asked our model dancers to pose infront of the bust of Rizal located at the Ilocos Norte Capitol. They posed with a praising act. It is but proper to praise the patriotic deeds of this hero. He was an instrument in liberating the country from the oppresion of the Spanish forces during the colonization of the country. José Protasio Rizal Mercado y Alonso Realonda is the complete name of the national hero of the Philippines. He is a foremost Filipino patriot who championed the reform of the Philippines during the Spanish colonial era. He wrote two great novels Noli Me Tangere and El Filibusterismo which were subversive to the Spanish regime and that these books incite rebellion. This was the heroic act and paved way for claiming freedom from the Spaniards. Rizal was born on June 19, 1861 and was executed on December 30, 1896 at 35 years old at Bagumbayan, Manila that caused the Philippine Revolution.